Why do we seek out challenging experiences in the outdoors? And why does the pain, suffering and risk make them more rewarding? We talked to a leading sports psychologist to find out. After a disappointing defeat on Grand Teton last year, Scott, Issac, Ryan, and I were determined to return and climb this mountain. But what is it that made us want to come back? Why would we return to the same destination two years in a row? Why would we attempt it in inclement weather? We talked with Duncan Simpson Ph. D. of Barry University, an Associate Professor of Sport, Exercise, and Performance Psychology (SEPP) in the School of Human Performance and Leisure Sciences. He has done tons of research on ultra marathon running, mental toughness, thought-processes while running, and long-distance kayaking with papers published in many technical journals. In other words, he is the perfect guy to give some expertise on the psychology of our adventures. IndefinitelyWild: What goes on inside you head when you decide to go against your better judgement? Duncan Simpson: When it comes to decision making, we tend to assume that people will weigh the costs and benefits of their choice and choose the reasonable course of action to maximize benefits and minimize costs. However, the process is not as simple as that and, in fact, empirical research suggests that people actually process information in two different modes, one identified by terms such as “rational”, “analytical”, “deliberative” and the other terms such as “experiential”, “automatic”, and “intuitive”. It is the context of the situation that appears to impact the required processes. For example, pacing decisions (time, distances, splits etc) while running will likely require analytical processing, whereas decisions regarding where to run (i.e., location) may be more automatic or experientially determined. To connect this to adventures outdoors it would seem logical that many of our decisions would be emotionally driven given our connection to the outdoors and unfortunately be driven by experiential, automatic, and intuitive processes. We made all the preparations we could and decided to camp at the Teton Climbers Ranch, which is an awesome dorm-style camping lodge at the trail head. $25 per person per night gets you a bunk in a cabin. The 8 of us were able to score a cabin all to ourselves. The night of our anticipated departure, it was pouring. A 2 AM alarm struggled to overpower the sound of rain thundering in on the tin roof. We snoozed for another 2 hours before finally, someone in the group said, “We’re going.” No part of me wanted to get out of bed and climb into the clouds in the pouring rain. But I did. I got out of bed, and we set off in the rain and the cold. The rain would pause every now and then, and once it did we were treated to a gorgeous sunrise. I was starting to remember why I was ok with the decision to GO. IW: Why is pain rewarding? DS: Pain can feel rewarding when it is associated with an outcome that we value. For example, the pain a runner will feel at the end of a marathon will be interpreted as positive given his/her successful completion of the race. The same level of pain would probably be viewed as negative had the runner not completed the race. We have long been told that nothing comes easy in life and that we have to work hard to achieve things. The hard work and difficulties (including pain) we endure are a key part of the feelings we experience when we are successful. For example, to climb a difficult mountain will likely involve some physical and psychological challenges and perhaps a high level of pain. However, upon successful completion of that climb the pain will be usually be associated with the positive outcome and hence be rewarding. 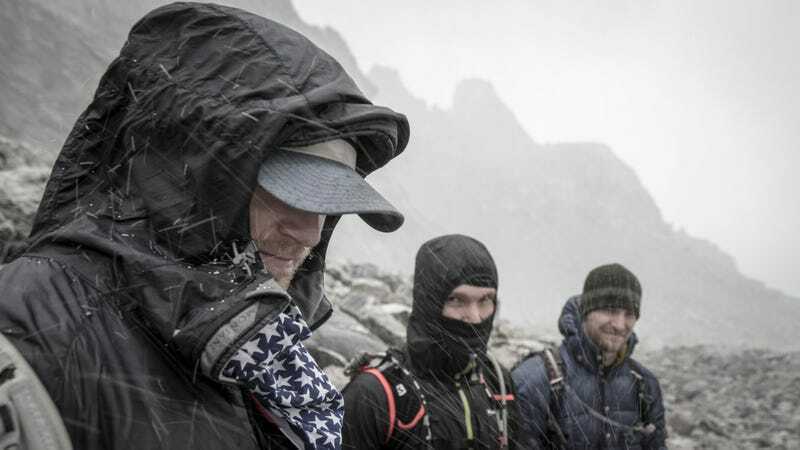 Light rain, hail, and snow would all just bead up and roll off the incredibly soft Patagonia Nano Air Hoody, a super breathable insulation layer that I kept on for most of the trek. A lack of pit vents kept it from being as breathable as I had hoped though. A small running pack from Osprey, the Rev 12, had room for all the snacks and spare layers I needed for this wet adventure. My feet stayed glued to the rocks with the FriXion sole of the La Sportiva Ultra Raptor, a new favorite for trail running and light hiking. IW: Why does something that has defeated us have a hold on us? DS: This will depend on how you interpret success vs failure. According to Need Achievement Theory some people are motivated to Achieve Success (a.k.a achievement motivated) whereas others are motivated to Avoid Failure. If you are a high achiever you will generally seek out difficult situations where the probability of success is 50/50 and therefore success becomes a challenge. However, low achievers will avoid challenging situations in order to avoid success. Those individuals who are gripped by past “defeats” are probably motivated by the challenge that situation presented. For example, if you are achievement motivated and you feel you have the ability to successfully run a 100-mile race but failed to complete it, you will be motivated by desire to succeed and will thus try again. However, those motivated to avoid failure are unlikely to even attempt such a challenging scenario, as they are afraid of failing and afraid of how their failure will be evaluated by others. From this vantage point, about 5 miles from the trail head and behind a large mountain, I was able to communicate with Valerie via the new Garmin Rino 650T. We relayed info on our situation and safety. Full review coming soon. It was ultimately a simultaneous bolt of lightning and crack of thunder that turned us around just shy of the lower saddle. The summit still remains out of our reach, but we will try again...maybe in a few years. We basically ran all the way down the mountain in the rain. All of me was completely soaked, either from rain or from sweat. Once we made it to the car, we were collectively relieved, but at the same time able to look back on the day and consider it a success. We did not make the summit for the second year in a row, but we do have a memory to tell and another opportunity waiting for us. Duncan’s helpful and insightful info sheds new light on why we will keep going back. The Grand Teton represents a love affair to me. I love this mountain, it’s prominence, and the fact that it remains a challenge to me each time I visit. And because of that challenge, we will return. For more info on Sport’s Psychology, check out the Association for Applied Sport Psychology.